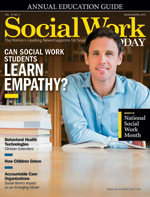 Our cover story recognizes that while most social workers identify empathy as a professional requirement, they may be at a loss to explain exactly what it is. Merriam-Webster and the Social Work Dictionary list definitions, but many students, instructors, and even researchers struggle to define it with certainty—and with even less certainty, how it is acquired. Neuroscientists maintain they have identified the type of brain cells responsible for empathy, but it's unclear how much adults can alter those innate neural imprints. Even without conclusive answers, educators are teaching and modeling empathy in the classroom—and social work students are welcoming this effort even while many cite their personal hardships as having embedded in them feelings of empathy for their clients. Instructors are trying to nurture empathy indirectly by teaching related skills such as self-awareness and reflection, and students are willing to build on their personal experiences for a deeper sense of understanding of their clients' challenges. According to Kristen Zaleski, PhD, LCSW, a clinical assistant professor at the University of Southern California School of Social Work, whose academic focus includes neurobiology, "It's not something your brain just builds, it seems. Empathy needs to be taught to you." I have often heard an adage, "Social workers are born, not made," suggesting that one is either born with the empathy to be a social worker or one is not. But neurobiology appears to foster the belief among researchers, professors, and students that practices that build self-awareness and reflection do nurture the neural circuits that are embedded with the basics of empathy, and could deepen this capacity with repeated exercises of certain skills. Many thanks to all social workers this National Social Work Month! Keep doing what you're doing! It's making a difference!